I didn’t meet the woman who would become my wife until I was 25. At least I don’t think I had met her before then. We did grow up within 10 miles of each other and she did have an older brother who was my age, and we did do some of the same things like going to the Minnesota State Fair. So it certainly is possible that if we didn’t meet that we at least rubbed elbows at some point. In fact I have thought in the past how interesting it would be to see a “life travels” map that shows your movements and allowed you to overlay the travels of others, for exactly this reason – to see if your paths had ever crossed before. I think it would be incredibly fascinating. And of course completely ludicrous. Right? Well, maybe not so much. 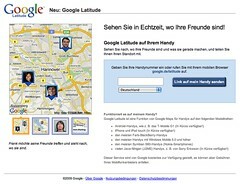 Have you seen the new Google Latitude? It promises the ability to “See where your friends are in real time!” by mapping your movements through the cell phone network. Of course this is an opt-in program and there are many options for controlling privacy, but it causes me to think about what could be in the future. It really isn’t much of a stretch to start imagining the tracking being done through embedded microchips rather than cell phones that could be left at home. And I certainly could envision a future where instead of being opt-in that those microchips begin to be embedded by worried parents and finally as a standard for any new birth. Massive databases could begin to store the historical tracking data, Google Street View could go from being static snapshots taken annually to real time photos. It would be simple to build an application that allowed you to track multiple people, giving you the option to fast forward through their life history until the subjects were within a certain range, at which point you could cross-index with Google Street View images at the same moment. Sci-Fi stuff to be sure, but it just doesn’t feel that far-fetched anymore.